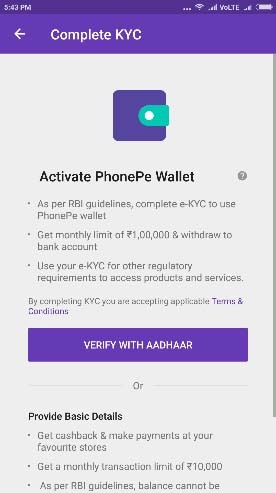 As per Reserve Bank of India guidelines it is mandatory to complete e-KYC to use PhonePe Wallet. Without completing e-KYC, a PhonePe user will not able to top-up wallet, transfer money to bank from wallet, add bank account or add new card. Which means most of PhonePe features would be disabled if you have not completed your e-KYC. So today in this post we will direct you on how to complete PhonePe Wallet KYC Online to enjoy PhonePe Wallet with full features. You can complete your PhonePe Wallet KYC through Aadhaar or by providing any other document and basic details. But both verification system has pros and cons, like if you are completing your PhonePe Wallet eKYC via Aadhaar verification than you would be entitled to get monthly limit of ₹1,00,000 and withdraw to bank and if you are completing your PhonePe Wallet KYC by providing any other documents like Driving License, State Government ID Number, NREGA Job Card Number, PAN Card, Voter ID, Central Government ID Number, or Passport than you would be entitled to get monthly limit of ₹10,000. Below we have explained both methods to complete PhonePe Wallet KYC Online. Before proceeding to complete PhonePe eKYC via Aadhaar make sure your mobile number is registered with Aadhaar Card, as OTP authentication is must without it you would not be able to complete your KYC with Aadhaar Verification. To complete PhonePe Wallet KYC just open PhonePe App. Just tap on Complete KYC option. Complete KYC page will be opened, just tap on verify with Aadhaar. From next page you will have to give your consent to use your biometric and demographic information of Aadhaar by taping on I agree button. 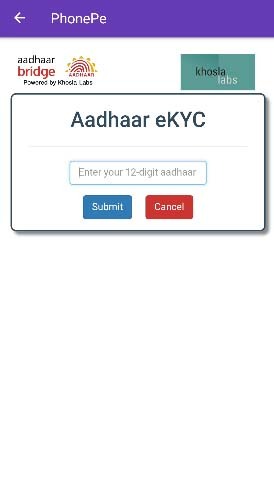 Enter your 12 digit Aadhaar Number in enter your 12 digit Aadhaar field and tap on submit button. 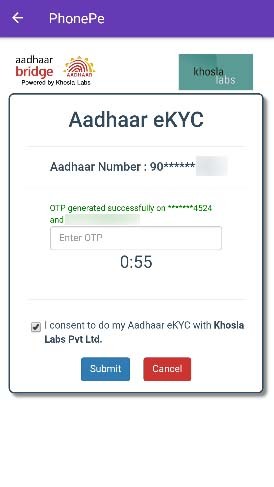 From next page tick mark on “I consent to do my Aadhaar eKYC with Khosla Labs Pvt Ltd.” And just tap on generate otp. You will receive one time password on your Aadhaar Registered Mobile Number. Enter the received otp in enter otp field, and Tap on submit button to proceed further. 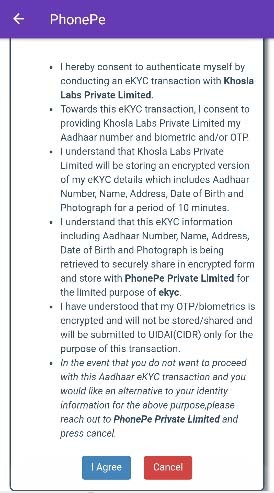 Next you will have to again tick mark on “I allow Khosla Labs Pvt Ltc to share my eKYC data with PhonePe Private Limited for the purpose of eKYC” and tap on submit button. On next page a message will be displayed saying KYC Verification Successful. That’s it you have successfully done your PhonePe Wallet KYC Verification. Complete KYC page will be opened, just scroll down and tap on use another document. From the options Driving License, State Government ID Number, NREGA Job Card Number, PAN Card, Voter ID, Central Government ID Number, or Passport select the document which you would like to submit to complete your KYC. 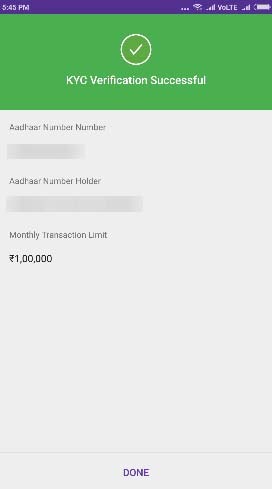 Enter the document details in below field and tap on verify button. 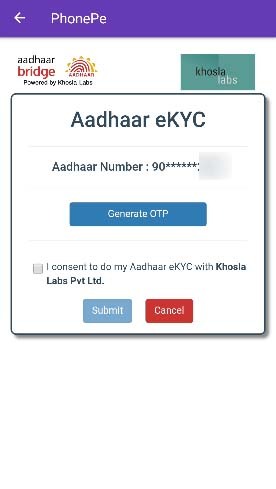 That’s it this is how you can complete your PhonePe Wallet eKYC without Aadhaar Card incase if you don’t have Aadhaar or don’t have mobile number registered with Aadhaar Card. Since the 31st of March of this year I’m not being able to complete E-AADHAR verification on my PhonePe app. What should I be able complete the verification process. Also allow me to know when I shall be able to complete the KYC process. I verified my phonepe with election card but my transfer from wallet to bank is not possible… Everything ask me for ekyc but when I click continue there is an error..My money is stuck in phonepe wallet.. In phonepe app how to enter in kyc driving license ?